Boasting a ‘perpetual’ construction process that spanned over two millennia (circa 21st century BC to 1st century AD), the ancient Karnak temple perimeter, mainly dedicated to the Theban triad of Amun, Mut, and Khonsu, is considered as one of the largest (or possibly even the largest) religious complexes in the world. When translated to jaw-dropping numbers, the sheer size of the compound, in its complete form, covers a whopping 200 acres or 1.2 million sq m (approx. 13 million sq ft) – the equivalent of over 220 American football fields! Within this astounding spatial scope, the sacred enclosure of Amun alone flaunts an area of 61 acres, while the famed Hypostyle Hall measures 54,000 sq ft – which makes the largest room of any religious structure in the world. 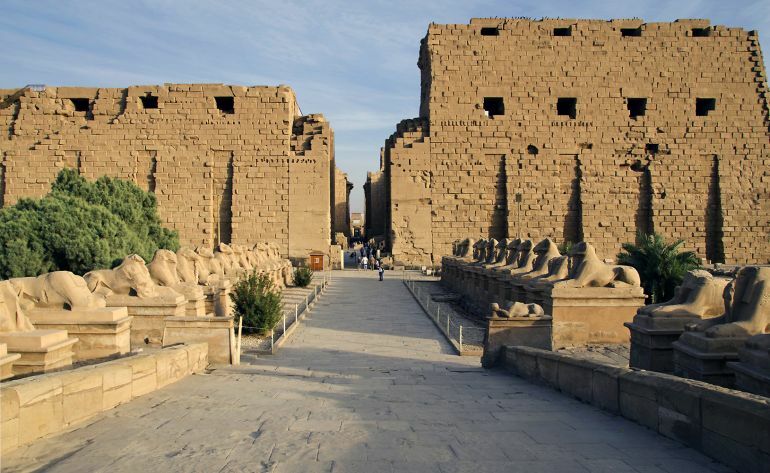 Suffice it to say, the Karnak Temple Complex was symbolically important for the ancient Egyptians, with Karnak itself being called Ipet-isu – “most select of places”. As such, the colossal site served as a pilgrimage center for nearly 2,000 years – with the veneration and fanfare focused on the main sanctuary and the proximate sacred lake that made room for the enormous floating barges of the Theban Triad. As part of this [aforementioned] goal, a 3D Virtual Reality model of the temple was constructed, offering students a completely new way to view the temple: reign-by-reign, following the complex patterns of royal construction, modification, and destruction that are now obscured by the latest building phases at the site. Footage of this model, as well as original videos and maps, are accompanied by thematic essays written and reviewed by Egyptologists to supply students and instructors with reliable information in a digital and visually dynamic platform. Like many significant ancient sites of Egypt, the area of Karnak was already designated as a religious precinct, with the first monument at the site, comprising a column in honor of Amun-Ra (circa 21st century BC), possibly even harking back to the style of the Old Kingdom. This was followed by a mortuary complex built by Mentuhotep II (responsible for overthrowing the kings of the north and reuniting Egypt under Theban rule) on the opposite side of the river from Karnak, at the Deir el-Bahri site. In any case, the first known temple at the Karnak site itself was built by Senusret I (circa 1971-1926 BC) of the Middle Kingdom. The structure was dedicated to god Amun, and architecturally may have mirrored the style of the mortuary complex across the river. The successive rulers continued to add on to the core structure, thereby gradually incrementing upon the spatial scope of the humongous precinct. The New Kingdom of Egypt, roughly corresponding to the period between 16th century BC and the 11th century BC (encompassing the 18th, 19th and 20th Dynasties of Egypt), is often viewed as the Ancient Egyptian equivalent of an empire. Politically, the ’empire’ was fueled by imperialistic policies initiated by a succession of powerful Pharaohs, and as such Egypt reached its commercial as well as military peak. Symbolically, the New Kingdom of Egypt was also perceived as the native power that broke the shackles of the ‘foreign’ Hyksos rule (during the Second Intermediate Period). All of these factors were also reflected in the religious and architectural avenues of the burgeoning state. 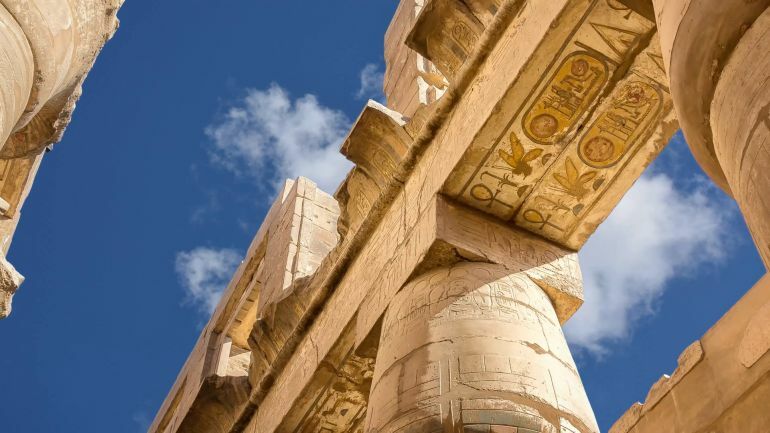 To that end, buildings, structures, and monuments took ever more colossal forms – and this ‘monumental’ trend was also perceptible in the case of the Karnak Temple Complex. 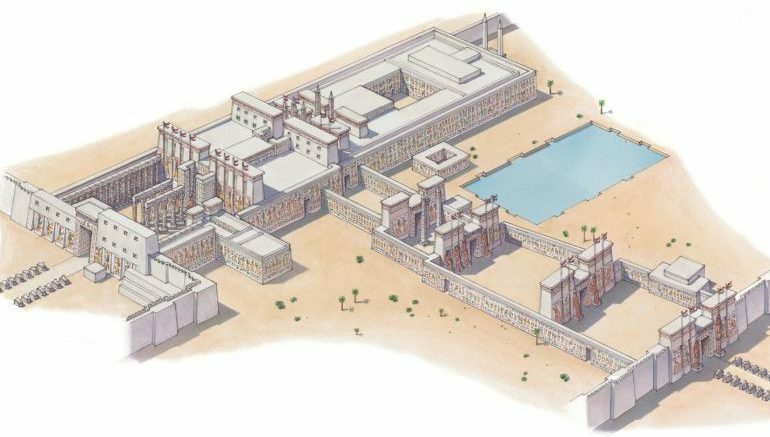 Consequently, the compound was majestically expanded with the aid of forced labor of inmates from the Great Prison at Thebes, along with the paid services of throngs of masons, artisans, and workers. This ‘enlarged’ scope was also evident from the inclusion of the worship of other Egyptian gods – like Osiris, Isis, Ptah, and Horus, within the grand enclosure of the temple complex that was previously solely dedicated to the Amun-headed triad. By the end of this period, it is hypothesized that mirroring the sheer eminence of the Karnak Temple, the massive complex possibly employed around 80,000 priests, and a few of whom were even richer than their pharaoh patrons. The Third Intermediate Period (circa 11th century to 6th century BC) signaled a time of upheaval and change for the Egyptian state with civil wars and the Kushite takeover of the realm from the south. This was followed by the invasions from Asia, led by the Neo-Assyrian Empire and then the Persian Empire. 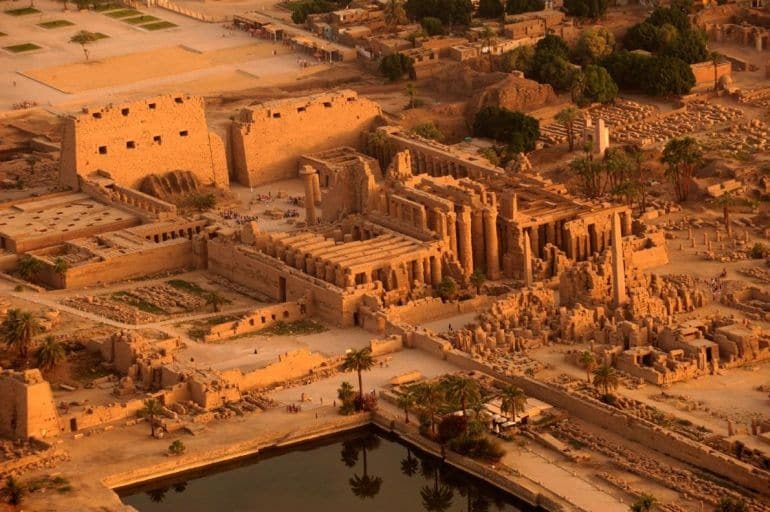 However, in spite of such political and military interventions, the Karnak Temple Complex continued to flourish architecturally – with the impressed Assyrians even rebuilding the nearby city of Thebes after they had destroyed it. 4th century BC witnessed the brief ascendancy of native Egyptian pharaohs who were back in the realm’s seat of power. During this time period, Nectanebo I (380 – 362 BC), the very same ruler responsible for reviving the Philae Island Temple Complex, also added an obelisk, a pylon (unfinished), and wall to the Karnak site, with the latter measure being undertaken to protect the temple from military forays. However, late 4th century BC saw the ascendance of Alexander and his successors, with one of the latter establishing the Greek Ptolemaic dynasty in Egypt. Intriguingly enough, many of the Ptolemaic rulers sought to marry cultural elements from both native Egypt and their original Greek homeland. The subsequent ‘synthesis’ resulted in Ptolemy IV adding a hypogeum (underground chamber) to the Karnak Temple Complex in dedication to Osiris, by circa late 3rd century BC. This was possibly the last known significant structural addition that was made to the massive precinct. Unfortunately, the Ptolemaic dynasty ended with the death of Cleopatra (or rather Cleopatra VII) in circa 30 BC, and Egypt was taken over as a province by the future Roman Empire. And while the Karnak Temple Complex was relevant as late as 4th century AD, when the Temple of Amun was briefly repurposed into a church by the Coptic Christians, the compound ultimately fell into disuse in the following century. However, the legacy of its imposing walls and gargantuan scale continued to inspire successive invaders, with the 7th century Arabs calling the complex ‘Karnak’ – derived from el-Ka-ranak, since they thought it was a huge fortified village.